1. Made her think: Talon ring w/ crystals, 2. BitterSweetsNY: Big boy Vamp ring, 3. BittersweetsNY: The Vampress, 4.BittersweetsNY: Baby Vamp Rings, 5. 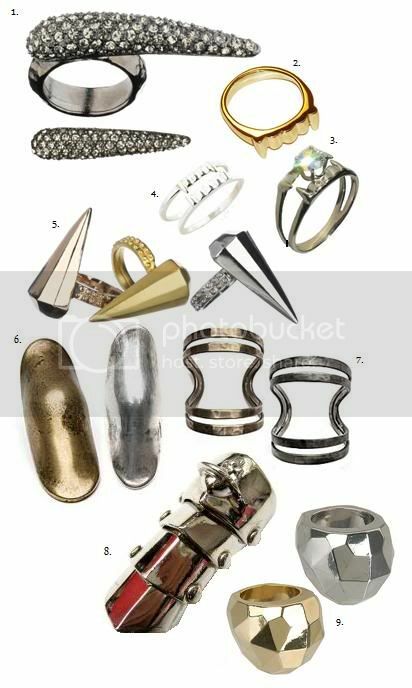 Made her think: diamond pendulum ring, 6. elizabeth and james: knucke ring, 7. elizabeth and james, 8.Vivienne Westwood armor ring, 9. Forever 21: faceted metal ring (is a knock off of Anne taylors faceted ring and Marroni's faceted ring.) 10. U.O. snake ring, 11. Elizebeth and James snake ring.